Finding the right school can be a formidable task for any college-bound student looking to find the right balance of academics, location and cost. Oklahoma is home to 54 public and private colleges and universities, offering a diverse range of academic opportunities and professional studies, with over 740,000 students enrolled. To help you gain perspective and sort through an ever-expanding wealth of education and government data, we have applied our rigorous methodology to the latest education data to rank the best colleges in Oklahoma, including the top four-year and two-year schools. In 2015, the State Regents adopted a new approach to higher education funding in Oklahoma focusing on new performance achievement criteria. This model seems to be having an impact on the quality of education in-state; Oklahoma is well on its way to meeting the goals of Gov. Mary Fallin's 2011 Complete College America initiative, surpassing yearly goals for increasing the number of earned degrees and certificates. The projections look good for continued college attendance, retention and awarded degrees and are bolstered by the Oklahoma's Promise program that provides scholarship funding to 18,000 high school students yearly. Oklahoma is ranked 17th in the country for Science, Technology, Engineering and Math (STEM) education by the U.S. Chamber of Commerce, fields considered crucial to the success of Oklahoma's economy in coming years as energy sector jobs continue to decline. Oklahoma is also ranked 5th in the nation by the U.S. Chamber of Commerce for affordability of higher education. To meet coming challenges Oklahoma is also implementing numerous technology initiatives designed to ensure the improvement of state communications infrastructure and greater correspondence between higher education institutions and local industry. Income gains are significant for bachelor's degree holders in Oklahoma, averaging +32.5% annual income over workers only holding a high school degree. Students holding a bachelor's degree also earn, on average, 1.66 times (a lifetime average of $2,567,174) the income earned by those who only hold a high school degree. Significantly, 85% of graduates remain in-state and hold jobs one year after graduation, a sure sign of the opportunities available for students post-graduation. Located in Norman, OU is among the best colleges in Oklahoma thanks to its reputation as a public research institution with a private college atmosphere. Diligent attention to landscaping, sculptures by renowned artists, and park and fountain settings make OU's campus as stunning as it is serene. With more than 30,000 students, OU boasts 18 colleges that together offer 170 academic programs. Students can study architecture, special education, journalism, and environmental sustainability, among many other programs. Meteorology is the most popular major, and other top programs include ballet, energy management, and entrepreneurship. While the school's state-of-the-art facilities spur innovation and promote academic rigor, students can also enrich their educational experience through study abroad programs in more than 80 countries around the world. About one in four OU students chooses to study abroad. Established in 1894 as Henry Kendall College, UT traces its roots to the Presbyterian School for Indian Girls, a small boarding school in Muskogee. Today UT is a nondenominational institution renowned among Oklahoma colleges for its exceptional research and academics. With more than 3,400 students and over 60 programs, UT boasts an average class size of 23 and a student-to-faculty ratio of 11:1. Undergraduate degree majors include energy management, film studies, sociology, theatre, and women’s and gender studies. Students can also choose to minor in fields like art history, Latin, and management information systems. UT's McFarlin Library supports students’ academic pursuits through its extensive resources, including 920,000 volumes, 620,000 titles, and 40,000 electronic periodicals. In addition, community service is a hallmark of UT. In 2014-15, the university’s nearly 3,000 volunteers donated more than 70,000 hours to community development programs. Located in Ada, ECU provides its students a rigorous and culturally relevant education. Originally established as a teacher's college in 1909, the university boasts a student body representing 20 U.S. states and more than 30 countries. ECU is undoubtedly one of the best colleges in Oklahoma and is the alma mater of five of the state's governors. Prospective students should rank within the top half of their high school class, maintain at least a 2.7 grade point average, and perform well on either the ACT or SAT. Degree programs are offered in fields like accounting, business administration, English, and music. ECU is the only institution in the state, and one of only a few in the U.S., to offer an accredited BS degree in environmental health science and one of only a handful in the country to offer an undergraduate degree in medical physics. Self-described as “America’s Brightest Orange” in recognition of its vibrant school colors, OSU was founded in 1890 as an agricultural and mechanical college. With its main campus in Stillwater, this standout institution among colleges in Oklahoma is highly regarded for its commitment to academics, research, and athletics. OSU boasts more than 50 national championships, as well as the Heisman Trophy and multiple gold, silver, and bronze medal Olympians as alumni. OSU's six academic colleges allow students to choose from among over 200 majors such as agricultural economics, computer engineering, and international business. In addition, the Honors College at OSU offers freshman research opportunities and strengthens students’ critical thinking through discussion-based classes led by expert faculty. OSU’s annual Research Week has celebrated the research and scholarly activities of students and faculty since 2004. The events include symposia, presentations, and exhibits for the university and surrounding community. USAO provides an interdisciplinary education that prepares students to succeed in their careers. USAO has held a distinctive place in the state’s higher education system since its founding as the Oklahoma Industrial Institute and College for Girls in 1908. As one of the best colleges in Oklahoma, the university is nationally ranked for educational quality and value and is known for small class sizes, award-winning faculty, and a campus culture that fosters close collaboration and research opportunities. Located in Chickasha, USAO offers programs in more than two dozen fields, including art, biology, literature, music, history, physics, and public policy. In addition, USAO offers a teacher education program, which includes 11 certifications and various specialty classes. USAO’s core curriculum engages students in 46 credits of coursework in the classical liberal arts. Two or more professors lead each of these classes to help demonstrate the underlying connections between different fields of knowledge. Based in Bethany, Southwestern Christian University offers more than 30 academic programs that are designed for students with professional and personal commitments. The university offers undergraduate programs in areas such as business administration, human services, sports management, and English education. Unlike other colleges in Oklahoma, SCU offers programs in religious studies, including seven bachelor’s degrees in Christian studies and master’s degrees in theological studies, ministry, and global Christian leadership. Many of SCU’s programs are available entirely online. Some distance learning programs feature asynchronous coursework. Others follow a professional studies structure, during which students take one class at a time as part of a small cohort. Application requirements vary by program, but all applicants must have a minimum 2.0 GPA. SCU offers affordable tuition rates and financial assistance, including aid for online learners. Located in Alva, Northwestern offers students an outstanding education in a rural setting. Founded in 1897, Northwestern boasts enrollees from not only 62 Oklahoma counties, but also 38 U.S. states and 21 countries. Additionally, the university's concurrent enrollment program for high school seniors allows them to earn college credit while adjusting to the rigors of higher education. Northwestern’s semester-based system consists of two, 16-week sessions in the fall and spring. Student classification depends on the number of credits in which they enroll, with freshmen generally completing no more than 31 credits. The most popular choices among the university's 40 degree programs include criminal justice, health and sports science, nursing, and psychology. In addition, students can prepare for professional fields like dentistry, medicine, and pharmacy through a pre-professional academic track that further positions Northwestern as a standout among colleges in Oklahoma. Established in 1910, OBU originally held classes in the basement of the First Baptist Church and Shawnee’s Convention Hall. Just 35 miles east of Oklahoma City, today OBU boasts an enrollment of over 2,000 students from 40 states and 35 countries. All students receive some type of financial aid. A liberal arts university rooted in the Christian faith, OBU encourages students to lead lives "worthy of the high calling of God in Christ." Known among colleges in Oklahoma for its faith-based approach to education, OBU's degree programs include anthropology, family and community service, international business, and multilingual communication. The honors program enriches classroom studies through colloquium courses and capstone activities that may include study abroad and a senior thesis. Additionally, the university's Student Success Center supports students by providing help with coursework and academic advising. Established in 1875, St. Gregory’s holds the distinction of being the state’s only Catholic university in addition to being one of the best colleges in Oklahoma. Rooted in Benedictine traditions reflected in both its academic curriculum and campus life, the university believes in educating the mind, body, and spirit to help students achieve academic, professional, and personal success. St. Gregory’s degree programs include accounting, English, fitness and health promotion, and visual arts. High school graduates seeking admission should have earned a minimum 2.75 GPA, ranked in the upper half of their class, and scored at least 21 on the ACT or 1,500 on the SAT. St. Gregory’s also welcomes adult learners, who can choose to earn a bachelor’s degree in business administration, early childhood education, nursing, or psychology. The university offers these classes in an eight-week format with flexible scheduling to accommodate work and family demands. OCU's mission to transform lives through the Christian faith, scholarship, and service is just one of the reasons the school ranks among the best colleges in Oklahoma. Situated over 200 acres in Oklahoma City, the school was established in 1950 as Central Christian College with just 97 students. Today nearly 2,600 students benefit from OCU's Christ-centered mission and enduring commitment to academic and spiritual development. OCU’s five colleges -- dedicated to biblical studies, business administration, engineering and computer science, liberal arts, and natural and health sciences -- offer more than 60 undergraduate majors. These programs include biology, computer science, psychology, and family studies. In addition, OCU's honors program enriches students’ experience through a cohort-centered program that encourages study abroad. The honors program also ensures eligibility for a Catalyst Grant to underwrite students' senior capstone projects. Central is a top public university that offers 117 undergraduate majors. Located in Edmond, the school prepares today’s students to become tomorrow’s leaders by encouraging creativity and innovation through a robust academic experience. Founded in 1890 as one of the state’s first institutions of higher learning, Central has earned a reputation as one of the best colleges in Oklahoma over its more than 125-year history. Undergraduates at Central can choose to major in programs like applied liberal arts, finance, organizational communication, and psychology. They can also select among more than 70 minors. Central’s financial aid ranges from awards of $500 to full tuition, with 85% of current students receiving some form of aid. Student life offers the opportunity to participate in one or more of Central’s 200 organizations and hundreds of events, which allow students to build friendships and to create lasting memories. With community, creativity, and connectivity at the core of its mission, OCU is a private institution affiliated with the United Methodist Church. Established in 1904 and located in the Uptown 23rd district, the school's more than 1,800 undergraduate students represent nearly every U.S. state and over 40 countries - a testament to its reputation among colleges in Oklahoma. OCU boasts a student-to-faculty ratio of 11:1 and an average freshman class size of 17. The university offers over 70 degree programs in areas like performing arts, education, and religion. In addition, OCU allows students to choose from among more than 20 disciplines for a minor degree. Undergraduate research opportunities engage students in creative work both in and out of the classroom, encouraging critical thinking through inquiry-based learning. Additionally, the school's honors program recognizes outstanding academic achievement while its World House Scholars program allows students to explore their interests in social and ecological justice. Located in Tulsa and committed to educating the spirit, mind, and body, ORU is a Christian university that shares its name with the evangelist who founded it. Students represent all 50 states in addition to 90 countries at this leading institution among colleges in Oklahoma. Of the university’s nearly 4,000 students, over 3,000 are undergraduates. ORU offers 65 undergraduate degrees, the most popular of which include biology, business administration, ministry and leadership, nursing, and psychology. The school's honors program allows students to engage in interdisciplinary seminars and to live in honors housing. In addition, ORU’s Leadership Studies Degree Completion program allows working professionals flexibility either to finish a degree they have previously started or to pursue a new field. This hybrid online degree program includes coursework in business, communication, and public policy while allowing learners to complete it at a cost-effective, accelerated pace. NSU is not only rated among the best colleges in Oklahoma, but it is also the state’s oldest institution of higher learning. Originally established in 1846 as the Cherokee Nation Female Seminary, the school has historic ties to the Cherokee Nation and Indian Territory that permit it the distinction of enrolling more American Indian students than any public university in the country. NSU offers 54 bachelor’s degrees. The most popular programs include accounting, business, criminal justice, and elementary education. Nearly all undergraduate classes (97%) enroll fewer than 50 students while 84% of classes enroll fewer than 30. In addition, NSU allows learners the flexibility required to pursue their college studies, which is why more than 2,000 of its 7,000 undergraduates pursue their degree on a part-time basis. In fact, NSU’s online program awards undergraduate degrees in disciplines like hospitality and tourism management, nursing, and organizational leadership. All students enjoy access to NSU’s three libraries, which also offer research assistance from expert librarians. Founded in 1946, Oklahoma State University Institute of Technology provides academic programs that emphasize practical skills and experiential learning. The university offers associate of science and applied science degrees in fields such as information technologies, culinary arts, and visual communications. Because the AAS programs are designed for students planning to enter the workforce after graduation, many of these programs include a speciality emphasis, such as pipeline integrity or watchmaking. OSUIT offers bachelor’s degree programs in IT and engineering. The university delivers online classes through the Desire2Learn platform in a flexible, hybrid format. OSUIT has one of the highest career placement rates among schools in Oklahoma and provides internship and networking opportunities through relationships with industry partners. The university offers affordable tuition rates and provides institutional scholarships and tuition waivers. Located in Lawton, Cameron University was founded as an agricultural school in 1908. Today, CU provides a variety of undergraduate and graduate programs. Bachelor’s degree options include programs in studio art, radiologic technology, allied health sciences, and agriculture. Cameron offers graduate programs in business administration, education, behavioral sciences, and leadership. Many of CU's programs include specialization options to allow students to customize curricula to meet their interests and professional goals. Learners can take classes asynchronously through Blackboard and can earn degrees entirely online, on campus, or in a hybrid format. Freshman applicants must have a minimum 2.7 GPA, have graduated in the top 50% of their class, and ACT or SAT scores of at least 20 or 940, respectively. Unlike other colleges in Oklahoma, Cameron exempts active-military members and applicants older than 25 from these requirements. Nationally recognized and known as one of the best colleges in Oklahoma, RSU is a regional, four-year institution located in Claremore with additional campuses in Bartlesville and Pryor. RSU's traditional classroom courses coupled with its distance learning options make it the ideal choice for learners who seek flexibility in completing their college degree. RSU’s degree programs include business information technology, computer science, military history, photographic arts, and social entrepreneurship. The President’s Leadership Class offers a four-year scholarship to 10 exceptional students each year to foster their personal, academic, and professional development. The program engages these students in special projects, volunteer activities, and alumni programs to complement their classroom studies. Additionally, students can complete their degree at RSU through Oklahoma’s Reach Higher program. Reach Higher allows individuals to apply previously-earned college credits to a degree completion program that best matches their interests and aligns with their schedule. Only 15 miles from the Texas border, SOSU's main campus sits in the city of Durant. Established as a teacher's college in 1909, this leader among colleges in Oklahoma has an enrollment of 4,000 students at eight locations, including Tinker Air Force base. Though its top five majors are biology, elementary education, health and physical education, occupational safety and health, and psychology, SOSU also offers degree programs in subjects like accounting, computer information systems, and political science. The school's Henry G. Bennett Memorial Library boasts more than 191,000 volumes, more than 514,000 microfilms, and in excess of 1,700 periodical subscriptions. SOSU's electronic resources homepage also lists all of the library’s online databases. In addition, the university's Career Management Center supports students as they prepare to enter the workforce by hosting job fairs and offering resume reviews. Formerly known as Hillsdale Free Will Baptist College, Randall University is committed to preparing learners to make a difference for Christ, His Church, and the community. Located in Moore, just south of Oklahoma City, Randall embraces the philosophy that a college should permit teachers and students to pursue God’s truth with freedom and responsibility. Randall’s four schools -- Arts and Sciences, Christian Ministry, Education, and Professional and Graduate Studies -- offer undergraduate degrees in various disciplines. These programs include business leadership, pastoral ministry, sports management, and teacher education. Students must complete a minimum of 120 semester credits (with at least 30 credits taught through Randall), maintain at least a 2.0 GPA, and earn a minimum grade of “C” in all courses related to their major to fulfill degree requirements. Outside academics, the university’s chapel further distinguishes Randall among colleges in Oklahoma by offering inspirational services twice a week in addition to hosting speakers and other special events. A private, Christian, liberal arts university founded in 1899, SNU cultivates "Christlike disciples through higher education." Located just west of Oklahoma City in Bethany, SNU developed through the merger of several small colleges that sought to train students for service to God and to their fellow man. More than 32,000 SNU alumni currently live, work, and serve in the U.S. and abroad. SNU’s myriad of degree programs includes accounting, computer science, history, marketing, and missions. In addition, students can choose programs such as pre- architecture, pre-law, and pre-seminary, which place them on a professional track. Working professionals can earn their degree through the university’s Professional Studies program. This program allows students to earn a bachelor’s degree in as little as 14 months by attending class one night per week and/or online. In addition, SNU stands out among Oklahoma colleges thanks to its variety of financial aid and scholarship options. 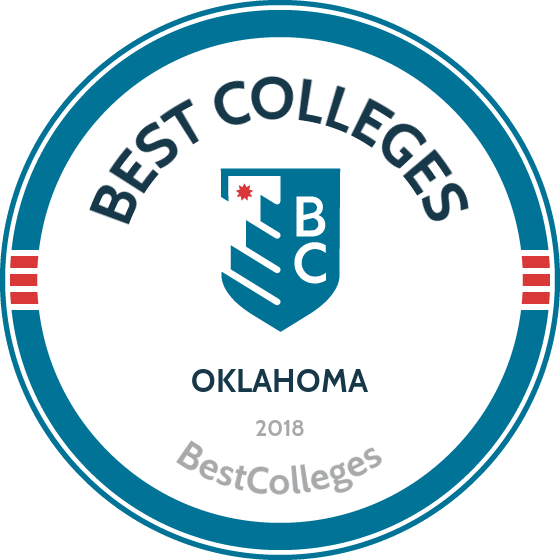 Known for its high-quality academics and unwavering efforts to support student success, SWOSU is hailed as one of the best colleges in Oklahoma. The school's historic roots date back to 1901, when the Oklahoma Territorial Legislature established it as the Southwestern Normal School. Located in Weatherford with a branch campus in Sayre, today the university offers courses both in-person and online through state-of-the-art technology that facilitates distance learning. SWOSU offers a myriad of degree programs, including biological sciences, education, mathematics, and parks and recreation management. Students selected for the university’s honors program enjoy a broad, interdisciplinary experience that affords an opportunity for an intensive capstone project. In addition, SWOSU’s Guard Officer Leadership Development (GOLD) program is open to Oklahoma National Guard soldiers who seek to become federally commissioned officers. The university seamlessly integrates the GOLD program into students’ curricula to cultivate these emerging leaders. Based in Oklahoma City, Mid-America Christian University was founded as a Bible institute in 1953. MACU offers associate and bachelor’s degrees in fields such as counseling, English literacy, and criminal justice. The university offers graduate degrees in ministry, leadership, and management. MACU also provides a variety of teacher education degrees, including early childhood, vocal music, and mathematics programs. The university's integrated distance education platform allows students to earn certain degrees entirely online, such as business leadership. Unlike other schools in Oklahoma, MACU emphasizes community engagement. Students have access to academic and career resources. In-state and out-of-state students pay the same tuition rates, and the university offers discounted tuition rates for online learners. Oklahoma State University–Oklahoma City enrolls more than 6,000 students annually. The university maintains a comprehensive list of academic programs, including associate degrees in areas such as horticulture technology, sustainable energy, computer information systems, and enterprise development. OSU-OKC also offers a bachelor's of technology in emergency responder administration. The university offers online, asynchronous courses and provides entirely online programs, including two certificates in education administration, eight associate degrees, and a bachelor’s in emergency responder administration. All students may apply for financial aid; OSU-OKC offers tuition waivers based on academic achievement, institutional scholarships, and transfer scholarships. Students have ample opportunities for campus engagement and professional development, including service learning experiences and an honors program. Graduates are prepared to enter careers or pursue further education. An evangelical, four-year institution of the Wesleyan Church located in Bartlesville, OKWU places the primacy of Jesus Christ, the priority of scripture, the pursuit of truth, and the practice of wisdom at the core of its approach to education. OKWU encourages focused study and critical engagement to spur critical thinking, which is why the school rates among the best colleges in Oklahoma. Undergraduates who reside on campus can pursue majors in fields like biblical studies, English, human resources, pastoral ministry, and sports marketing. Students can draw inspiration from the institution’s chapel curriculum, which builds knowledge and application of biblical truth. The university also serves working professionals who wish to complete their degree at an accelerated pace. OKWU's online program offers undergraduate degrees in fields like business administration, criminal justice, ministry and leadership, nursing, and organizational management so distance learners can balance coursework with the demands of everyday life. Located in Goodwell, OPSU offers baccalaureate and associate programs. With academically enriching programs of study, the university encourages public service and promotes lifelong learning. OPSU's strong commitment to excellence in education and scholarship explains why it continues to be counted among the best colleges in Oklahoma more than a century after its founding in 1909. OPSU guarantees admission to high school graduates who both earned at least a 2.7 GPA and ranked in the top half of their graduating class. Colleges at the university offer degree programs in fields like agriculture, business and technology, education, liberal arts, science, math, and nursing. In addition, the school's University College provides academic counseling and instructional assistance to students through bridge coursework. OPSU also has opportunities for student athletes; teams include baseball, football, golf, softball, and volleyball, as well as the school’s equine and rodeo teams. Associate degrees are considered to be essential for providing specialized courses and unique education opportunities relevant to the local economy. These programs often focus on continuing professional education and provide working students with an opportunity to advance their careers and accrue credits that can later be applied towards a four-year degree. Students can check the Oklahoma State Regents for Higher Education site to see if their credits are eligible for transfer. Two-year certificate and associate programs awarded in Oklahoma increased 3.2% (10,864 to 11,212) from 2012-13 to 2013-14, reflecting an upward trend in research funding and expanding research volume. Data gathered in a comprehensive 2013 report on the Oklahoma education system by Battelle shows a significant income increase of +17.4% for associate degree holders, compared to those with only a high school diploma. Over the course of a full working life, associate degree holders earn 1.24 times (a lifetime average of $1,801,373) more than workers who hold only a high school diploma. Associate degree holders also enjoy greater financial security, with 65% of employees holding an associate degree having employer-provided pension plans. Carl Albert State College serves students at campuses in Poteau and Sallisaw with programming ranked highly among community colleges in Oklahoma and the nation. CASC students have access to affordable tuition at an institution with graduation rates among the best in the state. The school offers associate of arts, associate of science, and associate of applied science degrees in a number of fields. AA degrees can be earned in fields ranging from business administration and social science to computer information systems and pre-law-criminal justice. Of particular note is the school's AA in general studies. This AA has several tracks, including communications, religion, and speech theatre. The school's AS degrees can be earned in fields such as allied health and enterprise development, while AAS degrees may be earned in fields such as applied technology, nursing, occupational health and safety. Campus life includes cultural enrichment activities, lecture series, and special events. Oldest among Oklahoma community colleges, Northern Oklahoma College is a multi-campus institution that provides high-quality and affordable educational programming. NOC’s catalog of associate degree programs is extensive, and available to students at campuses in Enid, Stillwater, and Tonkawa. Associate of arts degrees can be earned in the school in fields such as child development, English, education, and social science. The school's AA in enterprise development is available in two areas of concentration: business administration and general studies. Largest among Oklahoma community colleges, Tulsa Community College works to provide innovative, flexible, and affordable postsecondary education to about 27,000 students in Tulsa and northeastern Oklahoma. Students at its four campuses study a curriculum built on cornerstone values of student success, excellence, and innovation. TCC offers a full catalog of associate degrees in fields as diverse as business, child development, and engineering, to information technology, liberal arts, and management. Its aviation sciences technology program allows students to earn associate of applied science degrees in one of three concentrations: air traffic control, management, and professional piloting. From academic advising to careers services, TCC works to provide students with the resources necessary for a successful college experience. Transfer agreements with four-year institutions include Langston University, Kansas Wesleyan University, and Northeastern State University. A slate of events and activities bolster campus life, in addition to several active student groups and leadership opportunities. A branch campus of Community Care College, Oklahoma Technical College makes high-quality training accessible to students pursuing careers in an array of high-demand occupations. OTC is among two-year colleges in Oklahoma focusing exclusively on technical areas and the school's diplomas can be earned in fields such as automotive technology, heating and air/refrigerator, diesel technology, and welding technology. OTC students may work toward an AOS in business and industry management by first earning a diploma in as few as 12 months and then adding 10 more courses to earn an associate degree. OTC’s 65,000-square-foot-facility houses classroom and lab space, in addition to a two story-atrium and showroom, tool crib and parts counter, and the Learning Resource Center. OTC offers flexible schedules to accommodate busy lives and program instructors are highly skilled with real-world experience. Student services include financial aid search assistance, allowing students to make the most of, for example, tribal funding, GI bill tuition, and student loans. Founded as a junior college in 1931, Seminole State College now offers university-parallel coursework and one- and two-year degree programs formulated to prepare graduates for a variety of occupational fields. Eighteen college transfer associate degree programs are offered at the school. These programs cover a wide range of subjects, including criminal justice, education, health sciences, and liberal studies. Students seeking to directly enter the workforce can earn associate of applied science degrees in nursing, business technology, or medical laboratory technology. SSC is among community colleges in Oklahoma that offer college preparation programs such as GEAR UP, a program which promotes college and career success by providing services to students and their families. SSC students can join campus organizations such as Phi Theta Kappa, the Native American Student Association, and participate in athletics such as baseball, basketball, and softball. Located in Okmulgee, Oklahoma State University Institute of Technology helps prepare students for the workforce. Programs are offered on campus, but some courses are offered online, which allows working students, and those with other responsibilities, ultimate flexibility. The school offers credit for prior experience, such as military service; this allows learners to accelerate their studies and earn their degree quicker. Students can earn an associate in applied science, an associate in science, or a bachelor of technology through OSUIT. Applied science programs include automotive service pro-tech, construction management technology, air conditioner and refrigeration technology, and nursing. Associate in science degrees include allied health sciences, business, enterprise development, and information technologies. Most students who earn an associate of science degree plan to pursue a four-year degree. The applied science programs allow students to focus on a particular area of the workforce and graduate with the skills desired in that industry. Located in a 66,000-square-foot facility in Tulsa, Community Care College provides its students with occupational training that builds a foundation for solid careers. CCC is among Oklahoma community colleges offering diplomas in in-demand fields such as accounting, business and industry management, early childhood education, and paralegal studies. To obtain the AOS degree in business and industry management, students begin by earning a diploma and then adding 10 courses. Notable diploma programs include the school's fitness and health training, in which students receive one-on-one training, a personalized learning experience, and preparation for industry certification. The school's diploma in surgical technology program includes hands-on lab work that prepares students to perform a number of procedures in operating environments. CCC students also enjoy access to a career services team to help with resume development and job placement. Northeastern Oklahoma A&M College's stated mission is to provide students with academic excellence and opportunities for service and leadership. The institution, located in Miami, offers a catalog of associate degree programs in addition to occupational courses and opportunities for student recreational and cultural enrichment. One of the best community colleges in Oklahoma, NEO’s associate degrees are administered through seven academic departments. Available fields of study include computer information systems, business administration, sports management, general studies, nursing, and physical education and recreation. Notable transfer programs include the school's associate of arts in psychology and sociology (in which students take coursework in both fields), and its AA in psychology and sociology, social work option. NEO's offers student services such as tutoring, technology assistance, and university transfer support. NEO's rich campus life boasts nine intercollegiate athletic teams, rodeo, cheerleading, and more than 40 clubs and organizations. Redlands Community College provides its students with programming rooted in academic excellence, collaboration and service, in a student-centered environment. Redlands’ catalog of offerings range from technical certificate programs to associate degrees. One of the best community colleges in Oklahoma, Redlands offers associate degree programming in fields such as business administration, general studies, and criminal justice. Among the school’s offerings is its associate of science in pre-professional studies program, specifically designed for students planning to continue their studies at a four-year institution: the AS fulfils the requirements of the first two years of study for bachelor’s degree programs in areas such as agriculture, physiology, optometry, physics, and zoology. Designed to prepare graduates for a wide range of careers in the sector, RCC's associate of science and associate of applied science degrees in agriculture are also particularly noteworthy. RCC highlights that, unlike other community colleges, it places an emphasis on undergraduate research. In turn, students present at events such as national conferences and industry workshops. Established in 1926, Western Oklahoma State College promotes a commitment to community and regional workforce development, and provides high-quality educational programming to approximately 1,500 students. WOSC offers associate of arts, associate of applied arts, and associate of science degree programs in a range of fields such as criminal justice, social science, agricultural sciences, and physical and engineering sciences. WOSC is among community colleges in Oklahoma offering associate degree programs in aviation. The school's AAS in Aviation, a cooperative program with the Southwest Technology Center, has two areas of concentration: aviation mechanics and professional piloting. WOSC offers associate degrees designed for transfer to baccalaureate programs, such as its AS in physical and engineering sciences. Campus activities include a variety of intercollegiate sports, such as basketball, baseball, golf, and cheerleading. Advancing its tradition of excellence, Rose State College provides approximately 9,800 students with the academic and occupational preparation required to land well-paying jobs. RSC provides more than 60 associate degree programs to its students, many of which may be transferred to a bachelor’s degree completion program. While the school’s top declared major is nursing science, associate degrees can be earned in fields as diverse as criminal justice, engineering, medical laboratory technology, and family services and child development. The school's AAS in nursing science is a 69 to 70 credit hour program that features two tracks, beginning track and career ladder track. This program prepares graduates to become registered nurses. One of the best community colleges in Oklahoma, RSC offers an AS in environmental science, with three concentration options: quality and safety, natural resources, and science and analytics. RSC enjoys bustling student life: RSC students participate in a wide array of on-campus clubs and organizations, and engage in the arts or enjoy sports fitness activities. More than 28,000 students in Oklahoma City and surrounding areas attend Oklahoma City Community College each year. The institution’s catalogue of offerings includes certificate programs, hundreds of college courses, and associate degree programs for students seeking to transfer into baccalaureate programs at four-year institutions. OCCC offers students associate degrees in a wide range of disciplines, including art, business, and French to digital information technology, digital cinema production, and AS degrees in pre-professional fields such as dentistry. OCCC’s AA and AS in diversified studies allows students to craft a major targeting specific needs. The school offers flexibility with day, evening, and weekend classes, as well as online courses. One of the best community colleges in Oklahoma, OCCC’s student resources include its virtual learning center, which incorporates both online and on-campus components. Situated in one of the oldest towns in the state, Murray State College is a community college in Oklahoma with campuses in Ardmore and Tishomingo. Serving 10 campuses, MSC’s provides its 3,000 students with opportunities for academic achievement, professional success, and personal growth. The school’s curriculum leads to associate of arts, associate of science, and associate of applied science degrees. AA degrees can be earned in fields of study such as art; communications, with three concentrations; and enterprise development, with two concentrations. AS and AAS degree fields include agriculture, business, education, computer information, and math. The school's AAS degree program in gunsmithing technology provides students with the specialized skills necessary to build and repair firearms. Students at MSC enjoy access to cultural enrichment activities in the fine and performing arts, special events and speakers (such as through MSC’s Oklahoma Writers Series), and theatrical performances. Eastern Oklahoma State College’s academic programming prepares students to enter a vocational field or pursue a bachelor’s program at a four-year college or university. Operating in four locations in southeast Oklahoma, Eastern provides students with the means to earn associate degrees and certificates in a number of fields. The school’s catalog of 50 degree programs include associate of science degrees in agriculture designed for transfer to Oklahoma State University, and areas of concentration include agricultural economics, agricultural education, agronomy, and animal science. The school offers associate of arts and associate of applied science degree programs in fields such as behavioral and social sciences; business; language, humanities and education; nursing; science and math; and technical studies. Of particular note is the school's AAS in technical studies, naval technology option, designed for Navy personnel with technical training and job experiences in the service. Like some other Oklahoma community colleges, Eastern promotes intellectual prowess and physical fitness by way of health-conscious on-campus policies. With two conveniently-located campuses in Warner and Muskogee, Connors State College is one of the most affordable schools for students in the Muskogee area southeast of Tulsa. CSS started out as an agricultural school in the early 1900s but has since expanded drastically, now offering two-year degrees in business, communication and fine arts, math and science, nursing, and the social sciences in addition to its distinguished agricultural programs. Student organizations such as the Aggie Club, Math and Science Club, Student Government Association, Phi Theta Kappa, and Behavioral Science Club give students the chance to get involved in what they love and meet like-minded peers. If you're thinking about applying to one of the best colleges in Oklahoma, continuing reading to learn more about living in the Sooner State. Oklahoma is located just above Texas, between the Ozark Plateau and the Great Plains. It became a state in 1907 and encompasses extraordinarily diverse ecological regions and terrain spread over 69,898 square miles. Oklahoma offers a wealth of historical attractions, including a wide stretch of Route 66 and particularly strong Native American Indian heritage. Cultural attractions also include 300 museums and world-class sports facilities. Outdoor adventurers will find a wealth of activities and scenic locations in the 34 state parks and 78,500 miles of rivers and streams. Its largest urban center is Oklahoma City, located at its geographical center, closely followed by Tulsa (“Oil Capital of the World) in the northeast of the state. Recent decreases in oil prices have led to drops in employment in the energy industry, especially oil and mining. This trend has put stress on the local economy, with nonfarm employment expected to grow more slowly than the national average. However, Oklahoma's economy is transforming via rapid progress in technological infrastructure and educational initiatives such as the Training for Industry program. With an eye to tapping into global commerce in technology, aerospace and defense industries, Oklahoma is transforming itself into a hub of innovation. Agricultural science and biosciences are flourishing, and new technologies are being developed and applied to the oil and gas industries, with an eye to decreasing dependence on foreign energy. Oklahoma is a top-ten energy producing state in the U.S. and gas costs 7% less than the national average. Lower taxes than the national average and higher employment rates contribute to a higher quality of life as broadly reported by the Oklahoma Department of Commerce. The median price of a home is $137,000 and rent is approximately 25% cheaper than the national average. Oklahoma is undergoing diverse and exciting changes; a large portion of the state's students who attend college in Oklahoma live and work in state after graduation. For tuition purposes, and if the student intends to live in Oklahoma post-graduation for work, it is a good idea to establish residency. Residency is generally established by living in state for 12 months or longer, but students should be aware that Oklahoma has potentially strict domicile requirements. Domicile shows not only residency, but also the intention to remain. Attending college is considered to be temporary residency, and students seeking domicile must meet other criteria, often to be judged on a case-by-case basis. If the student is under the care or financial support of a parent or legal guardian then residency is dependent upon the status of the parent or legal guardian. Students who have graduated high school and have resided with a parent or legal guardian for two years prior to graduation are eligible for residency status. If parents are separated and either domiciled outside of Oklahoma, residency status will be subject for individual review.